We can create fancy visions of the purposeful work we want to do, but if we can't execute on a day to day basis, our big scheme is worthless. Funny enough, we learned how to do our days right way back in preschool. How do I know? Because my daughter, K, is there now, and her preschool parent-teacher conference occurred last week. As I read over her teacher's notes (presented in a a beautiful portfolio, no less - call it the annual review for the Lollaloopsie set), I noticed a ton of parallels to what I was reading in Alexandra Levit's book "A Twentysomething's Guide to the Business World: They Don't Teach Corporate in College." In the fall, K's teacher wrote the following goal in her portfolio: "asserting needs and wants and begin to negotiate conflicts with peers." Who among us doesn't need that written in our "annual goals" sheet?! Those of us who are terrific at negotiating conflicts tend to be awful at the other end of the spectrum. Just call us the doormats. And many of us are excellent at making our needs and wants known, but conflicts boil everywhere we go. i.e., The steamrollers. How to curb that? As K's preschool teacher might say, listen first and then speak second. And when we speak, we should present our full and honest truth without accusing or judging someone else. K is marked as "still practicing" that skill. How about you? If there's anything K is good at, it's prioritizing. Of course we should say "please" and "thank you." That etiquette gets us ahead in any setting. When was the last time you complimented someone concretely and sincerely? K did it just last night ("Mommy, I like those doggies on your pajamas. They are so cute!"). Hear that? A preschooler is showing you up. Time to get your complimenting on! Levit encourages twentysomethings to embrace the "C&C rule" of communication: clear and concise. Alexandra Levit explains that "a key ingredient in frustration is the lack of control that a person perceives for the outcome of their work." People who believe they control their fate (an internal locus of control) "are more persistent and work longer and harder to get what they need or want," than those who feels like victims of life (an external locus of control). Put plainly, the internal loci folks effectively manage their frustration. According to Levit, we can build our frustration tolerance just like we do in preschool: by consistent exposure to irritating situations. In other words, that long Wal-Mart checkout line was good for my daughter. And that painfully boring meeting you just sat through? That was good for you. 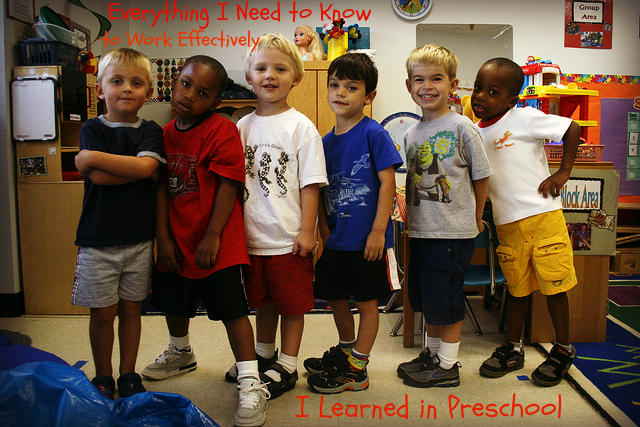 What did you learn in preschool that you now use (or should use...) in your workplace? Want more tips? I highly recommend Levit's book. While I've had fun drawing parallels to what we learned WAY back when in preschool, the reality is that she includes information that is essential for workplace success - and that we all too often forget to use. Based near Portland, Maine. Coaching over the phone around the world.